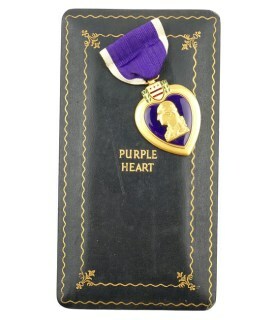 US Purple Heart Medal in Box. The set is not visible maker marked or dated. The medal comes in it's original box, complete with ribbon bar and buttonhole batton. Nice original set in good used condition! Canadian MK II Combat Helmet having a nice olive-brown overpaint, brushstrokes are clearly visible. A decal is clearly visible beneath the paint. The shell is nicely maker marked with 'C.L./C.' and both the shell and liner are dated 1942. Nice original helmet! 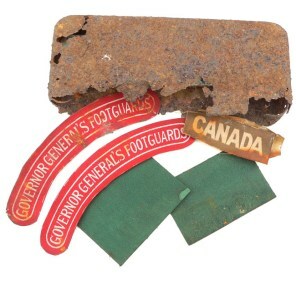 Dug Up Canadian Insignia Set consisting of a matching pair of 'Governor General's Footguards' Shoulder titles and a matching set of 4th Canadian Armoured Division patches. British made printed on canvas examples. Dug up in the Netherlands. Fantastic historical display piece! Canadian Sun Protection Goggles in Envelop. The goggles are nicely marked with '4-42 S. S. MFG. CO. Canada' indicating production in 1942. 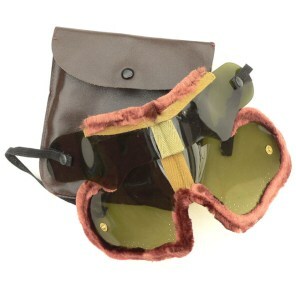 They are complete with their original simulated leather pouch wich is nicely Broad-Arrow marked. Nice set! U.S. 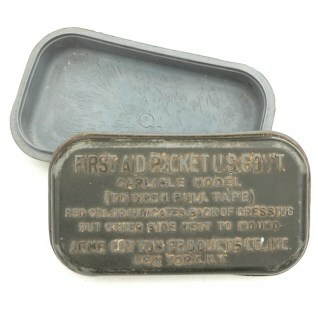 Plastic First Aid Packet (Carlisle model), the empty tin is nicely maker marked by the 'ACME Cotton Products Co.,Inc.' from New York. Hard to find plastic variant in good used condition! 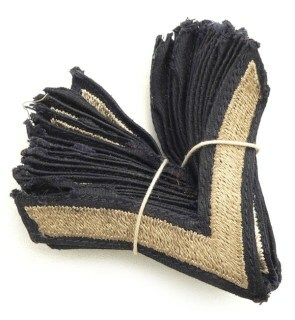 Bundle of 18 US Private First Class rank chevrons. Nice original patches in good condition! Canadian Tam o' Shanter with 'The Cameron Highlanders of Ottawa' cap-badge. The cap is nicely maker marked by the 'Brill Cap' company from Winnipeg and dated 1943. The size of the cap is a 7. Nice example in very good condition! World War 2 US Army 2nd Infantry Division "Indianhead" Patch. Nice original patch in good condition! 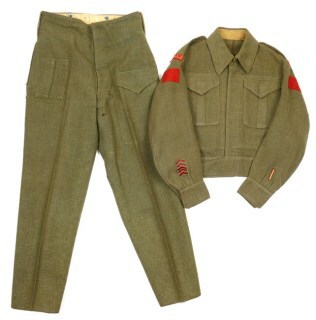 Canadian Battle-Dress Jacket & Trousers as intended for a Canadian soldier within 'Princess Patricia's Canadian Light Infantry', part of the 1st Canadian Infantry Division, which took part in the liberation of Italy and Western Europe. Complete with all period applied insignia. Great original tunic! 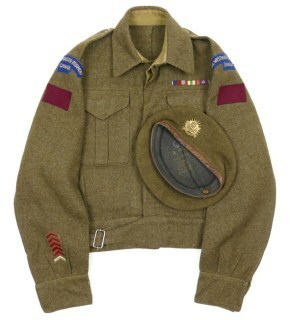 Canadian Battle-Dress jacket & Beret as intended for a Canadian soldier within 'The Royal Westminster Regiment', part of the 5th Canadian Armoured Division, which took part in the liberation of Italy and Western Europe. Complete with all period applied insignia. Great original tunic! 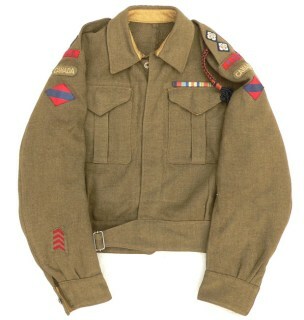 Canadian Battle-Dress jacket as intended for a Canadian soldier within the 8RCA (8 Royal Canadian Artillery), part of the 5th Canadian Armoured Division, which took part in the liberation of Italy and the Netherlands. Complete with all period applied insignia. Dated 1944. Great original tunic! 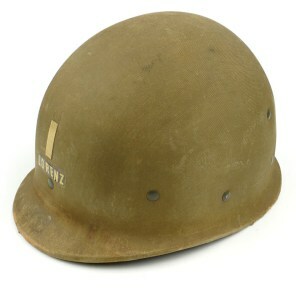 US M1 Helmet Hawley Liner. The liner is in slightly damaged condition, there is one tear on the wearer's right side, see photos. The chinstrap is regrettably damaged. Hard to find so-called Hawley liner in used condition! 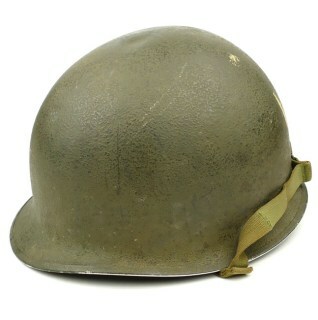 US M1 Combat Helmet with fixed bale and front seam. The liner is nicely marked with the logo of the 'Inland' company. The front of the liner has a nicely painted Lieutenant's bar. 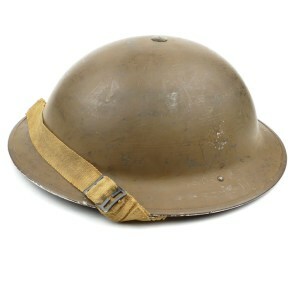 Nice original M1 helmet in good used condition! Rare original American Red Cross Suitcase. Black suitcase having painted on in red "Compliments of the American Red Cross". The suitcase is sized approximately 57 x 31 x 16 cms. Decorative orginal item in very good condition! World War 2 Canadian Balaclava. The woolen balaclava is nicely marked with the Canadian Broad-Arrow. Nice example in good unissued condition! Royal Canadian Signals MK II Combat Helmet having a darker fieldgrey camouflage overpaint, brushstrokes are clearly visible. A white and blue Royal Canadian Signals decal is applied on top of the overpaint. Nice original helmet in good used condition! British Airborne Red Beret. The beret is nicely maker marked by 'Kangol Wear Limited' and dated 1944. The beret is sized '7' marked. 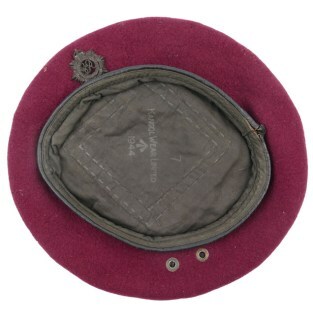 The beret comes together with a plastic economy type 'Royal Army Service Corps' cap-badge. 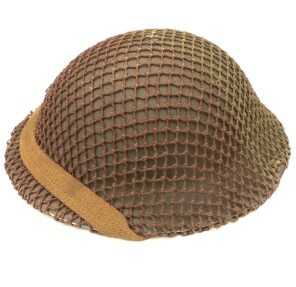 Nice original 1944 dated beret in good used condition! British WW2 Folding Saw in leather pouch. Complete with wooden grips and tools. The saw is nicely maker marked and dated 1944. The leather pouch is nicely maker marked and dated 1944. Nice original set in very good condition! 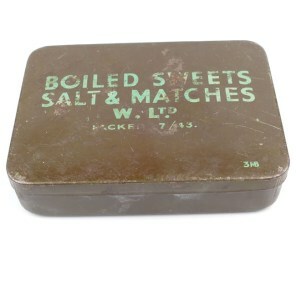 This is a nice original British 'Boiled Sweets, Salt & Matches' Ration Tin. 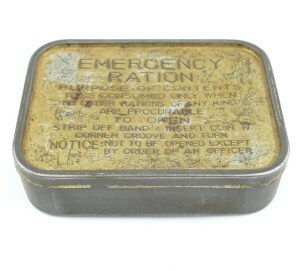 The empty tin is nicely maker marked with 'W. 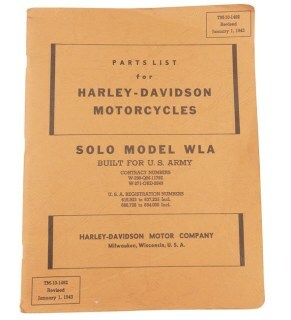 Ltd.' and dated July 1943. The tin is in overall nice used condition, some scratches and normal wear is visible. Very nice and desirable original item! 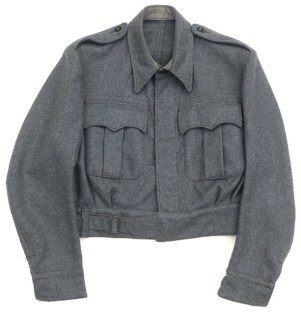 British Leather Combat Jerkin 1943. The size 2 jerkin is complete with manufacturers label from the company 'W.M. Curwen & Co.,Ltd.' from London and dated 1944. 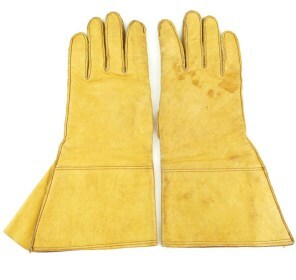 The leather is in very supple condition. Missing one button. Nice original example in very good condition! Nice pair of British Dispatch Riders Boots. 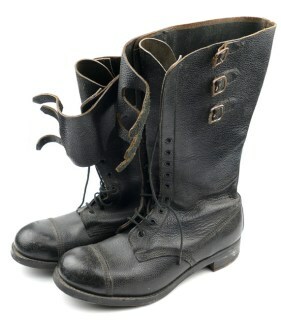 The boots are maker marked by the company of 'Allinson' and dated 1944, they are a size '9'. The boots are in good used condition, hard to find pair of British Motorcyclist's Boots! 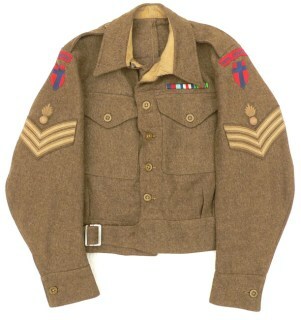 British P40 Battledress Jacket (Battledress Blouses 1940 Pattern). Complete with original manufacturer's label, it's a size 13, dated 1942. Nice original BD jacket in very good condition! Canadian Khaki Beret. The cap is nicely maker marked by the 'Grand'mere Knitting Company Limited' and dated 1945. The size of the cap is 7⅛. 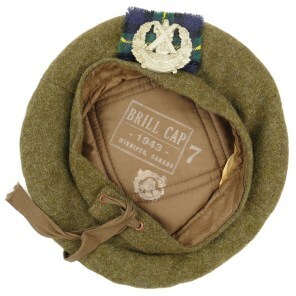 The cap is complete with a 'Cape Breton Highlanders' cap-badge. Nice original beret! This is a very rare example of a British Made Gas Detection Brassard. 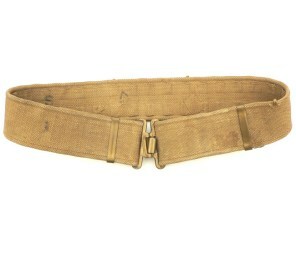 These brassards were issued for the Normandy invasion to both Britsh and American forces and meant to detect the presence of poison gas. Example in good condition! Canadian 'Argyll & Sutherland Highlanders Canada' Shoulder title. British made printed on canvas example. Nice original shoulder-title in good unissued condition! British WW2 Folding Saw in leather pouch. 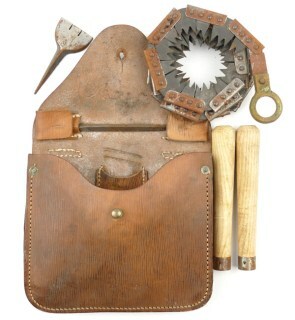 Complete with wooden grips and tools. The saw is nicely maker marked and dated 1943. 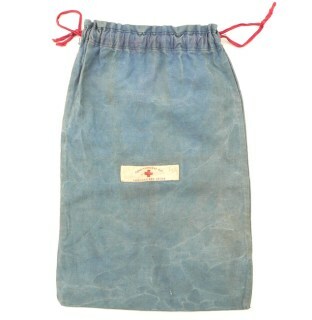 The leather pouch is nicely maker marked and dated 1942. Nice original set in good used condition! Canadian Dispatch Rider's Helmet. The helmet is nicely maker marked with 'C.L./C.' and dated 1944. The helmet shows some traces of years of storage, overall a very nice original Canadian Dispatch Rider's Helmet in very good condition, hard to find example!